Lindsay Burton recently retired from the CFO position, where he was responsible for corporate finance and operations at both the Logan, Utah and Durham, North Carolina facilities. Lindsay helped to keep Wasatch Photonics fiscally healthy and operating smoothly and efficiently – thereby providing a robust company which can satisfy the needs of our customers both in the short-term and long-term. Lindsay serves on the Company’s Board of Directors. 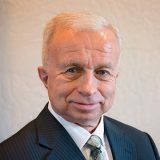 He brings 40 years’ experience: 10 years as a practicing CPA in Los Angeles, and 30 years as CFO of a number of manufacturing and scientific companies. Lindsay received a BS in accounting from Brigham Young University.